The chair in which Churchill sat at London's James J. Fox. Imagining the great Sir Winston Churchill without a cigar clamped in his jaws or between his fingers is almost impossible. Stories that relate his prodigious drinking abound. His appetites for both, in quantities that would render even the hardiest among us incapacitated, seem superhuman. What is real and what is legend? Was he truly—as he is so often portrayed—never without a smoke, drinking morning, noon and night? To uncover the truth, we reached out to the experts: Lee Pollock, trustee and advisor to the Board of The International Churchill Society, and Rob Fox, a co-owner of James J. Fox in London and Ireland. Legend: Churchill smoked a staggering amount of cigars. Reality: By any reasonable standard. Legend: He would smoke just about anywhere. Reality: According to photographic evidence. While visiting New York City in 1931, Churchill momentarily forgot that Americans drive on the right (or wrong, in his view) side of the road and was struck by a car. Upon his return home to England, Churchill was strapped to a gurney and put into an ambulance. A photo of the moment shows him smiling happily, puffing on his cigar. It wasn’t the only time Churchill was photographed on a stretcher smoking a cigar. 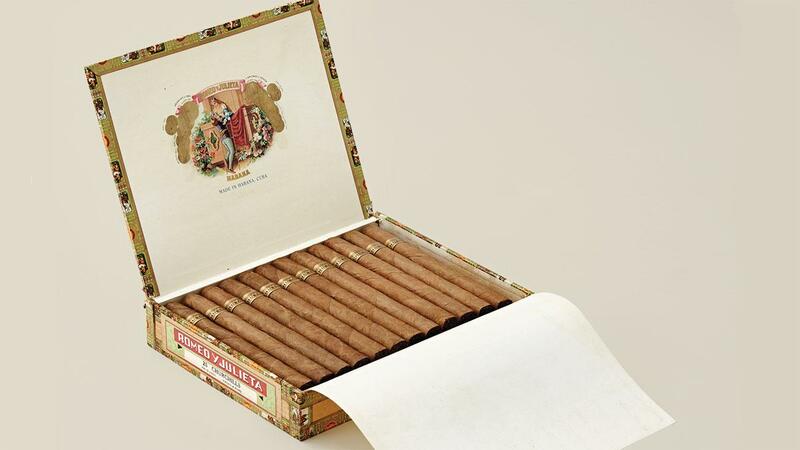 Vintage Romeo y Julieta Churchills, one of the most famous Cuban cigars. To find out when Churchills became Churchills, click here. Legend: He only smoked Churchills. Reality: Close, but no cigar. Cuba’s Churchill size—seven inches long by 47 ring gauge—was named for the great statesman, but he smoked cigars of varying size. “He bought all sorts of different brands and sizes,” says Fox, whose ledgers show repeated purchases of Romeo y Julieta Pirámides and Romeo Epicure Grandes, which are no longer part of the main Cuban Romeo line, as well as other smokes. Legend: He never shopped for bargains. Reality: Depended on the occasion. Legend: He had vast stocks of smokes. Reality: How big is your humidor? “At Chartwell, his home in Kent, he had a cigar storage area with 3,000 or 4,000 cigars,” says Pollock. Legend: His day began with a glass of Scotch. Just as portrayed in the film Darkest Hour, Churchill greeted the morning with a cigar and a Scotch and soda while in bed. Pollock explains that he would wake around 8 a.m. and begin reading through a stack of newspapers, not leaving bed until about 10. He would sip his Scotch, adding water to it throughout the day. Legend: He was often inebriated. Reality: He held his liquor. James J. 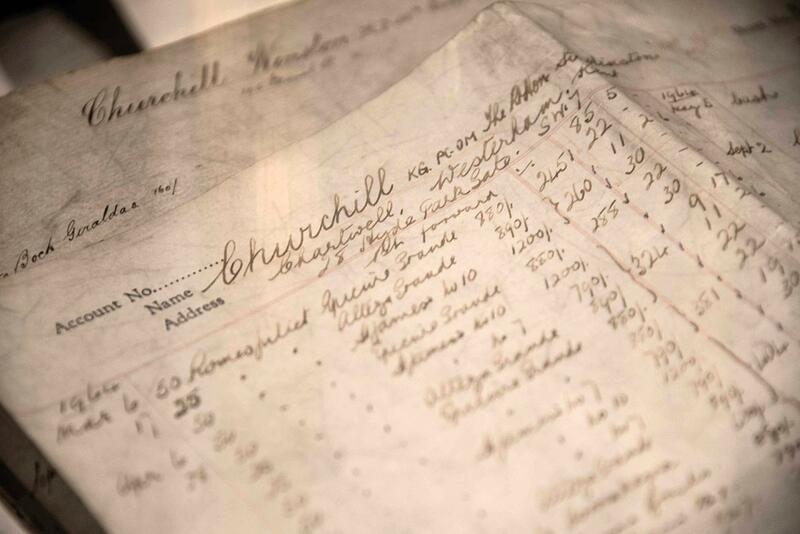 Fox still has the ledgers of Churchill's considerable cigar purchases. Legend: He was brand loyal. Reality: True, for his drinks…. Churchill’s Scotch of choice was Johnnie Walker Red or Black (blends were far more prevalent than single malts in his day) and he adored Pol Roger Champagne. “He became quite friendly with the Pol Roger family,” says Pollock. Pol Roger created a special Champagne in his honor, Pol Roger Cuvée Winston Churchill. Legend: He left few cigars behind. Reality: He smoked most of them. “There was never a big, huge auction of cigars at the end of Churchill’s life. It wasn’t as if he was buying to collect,” says Fox. 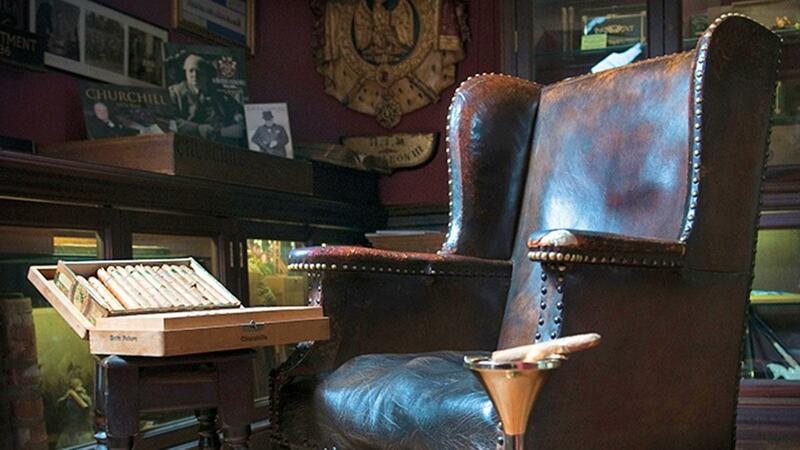 “He was buying to consume.” A box of cigars once owned by Sir Winston—along with the Romeo y Julietas it contained—is on display at Fox’s shop in London, under glass, along with a cigar case once carried by the Prime Minister.